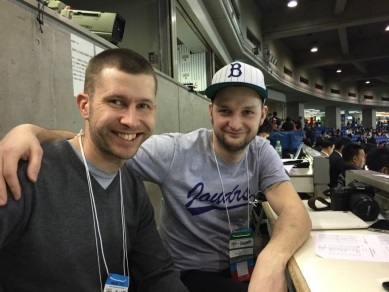 Among the over 100 or so media credentials issued for the two-game Global Baseball Match 2015 between Samurai Japan and Team Europe on Tuesday and Wednesday were two for Jakub Starik and David Agner, a pair of journalists from the Czech Republic. Baseball is pretty far down the pecking order in the Central European nation where hockey is king — Jaromir Jagr and Dominik Hasek are just two in a long line of NHL greats with Czech lineage — and whose borders consist of other hockey and soccer-mad nations Austria, Germany, Poland and Slovakia. Even so Starik and Agner traveled all the way from Prague for Czech TV, the nation’s public broadcaster, to document the European baseball team made up of athletes from six nations, including Czech infielder Jakub Sladek. Armed with a microphone, a video camera, and with Agner sporting a Brooklyn Dodgers hat he bought from a shop in Prague, the pair was bringing attention to the sport vying for exposure in an area already deeply invested in a number of other sports, such as volleyball, basketball and handball. It should also be important to the World Baseball Softball Confederation. Since baseball and softball were scrubbed from the Olympic program after the 2008 Games, the WBSC has been steadfast in its quest to prove, to the International Olympic Committee mainly, that the sports are indeed global endeavors not limited to traditional hot spots in North and Latin America and Asia. Further inroads into countries like the Czech Republic, or any number of European locales where other fans might be surprised to even know baseball is played, would certainly strengthen the confederations’ case. Starik agrees that the sport is slowing taking root. “It’s definitely growing,” he said. “It’s small when you count the numbers of players or you compare the numbers with Japan. But I think we have a great development program and Czech players are being recognized more and more by international organizations in the United States, and even in Japan because Jakub played here for one season (in 2012 for the independent league Ishikawa Million Stars). The Czechs are no strangers to the various goings-on in the world of baseball, even though the game still has only a minor presence. The sport is hardly new to the country. Sladek, now 25 years old, picked it up in elementary school. Starik described baseball as something “people are still discovering” in the Czech Republic. He feels the game gains more traction as the populace continues to learn about it. The trick for the WBSC is spreading that throughout the rest of the country. “People who do baseball there are really dedicated to the game, but most of the public doesn’t know that much about the sport,” Starik said. A breakout star who could reach MLB, or even NPB, could help draw more attention to the game. Baseball Reference’s archives list no players born in the Czech Republic after Jan 1, 1993, when the former Czechoslovakia peacefully split into the Czech Republic and Slovakia, having played in MLB. The site lists only three player having been born in Czechoslovakia, including Slovak Elmer Valo, who played in the majors from 1940-1961. Sladek made it as high as rookie ball with the Phillies and would advise young European players to go anywhere where they can play as much as possible. He noted, however, different countries had different methodologies for developing talent. “The States are obviously pretty good, but they aren’t pushing you as hard as they do in Japan,” he said. “In Japan, they’re going to push you to play at the best level you can. In the States, you have a chance to do well, but it’s on you. If you don’t wanna work hard, then sorry. Here they’re going to push you and you have to do it. I would recommend going to the States or come here.